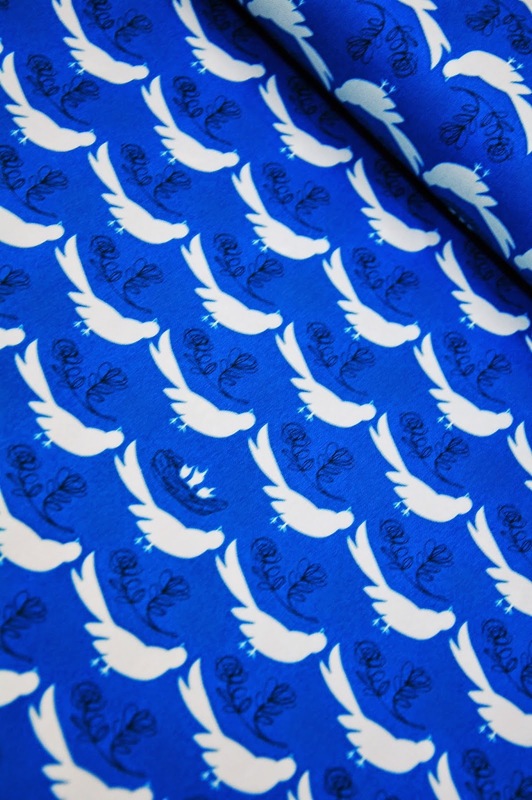 There is another bird print by Hokkoh on cotton canvas that is stunning- great for bags, cushions, baskets etc and in the most gorgeous shade of blue. 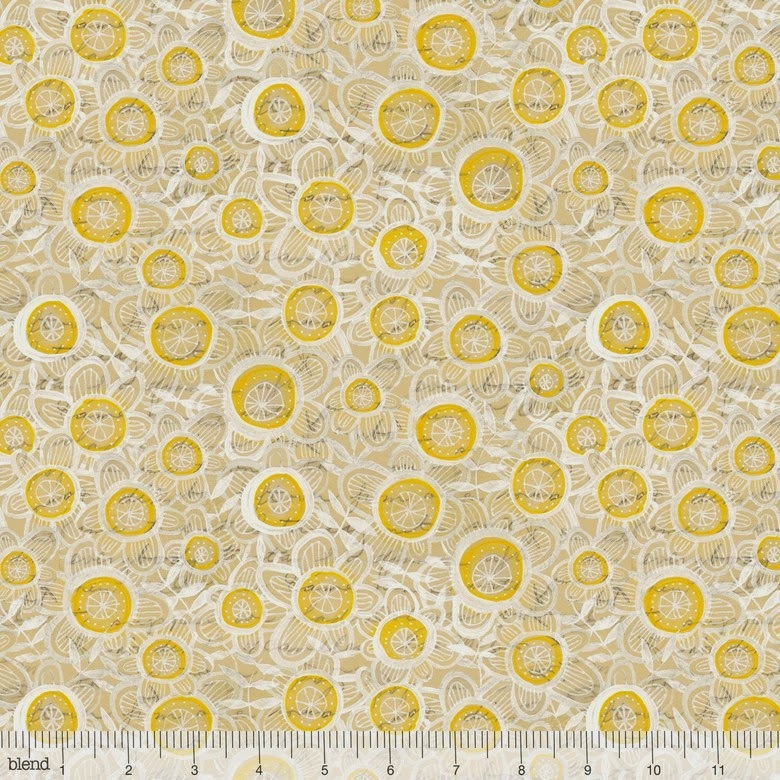 This print, Daisy Play in yellow from The Makers by Cori Dantini for Blend fabrics caught my eye. 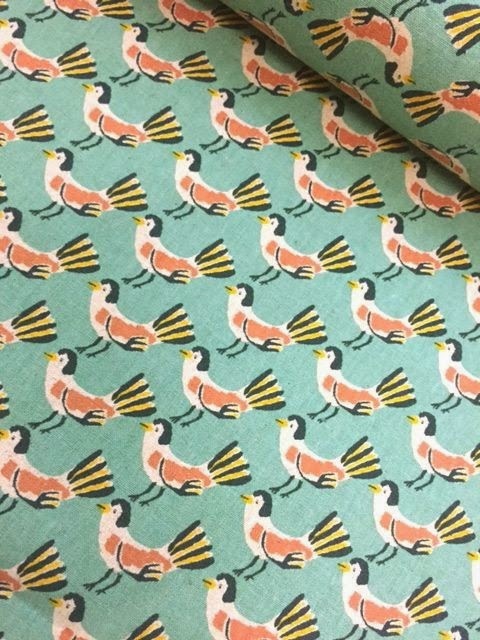 A very soft pattern, it reminded me of Angie Lewin's lino cuts. 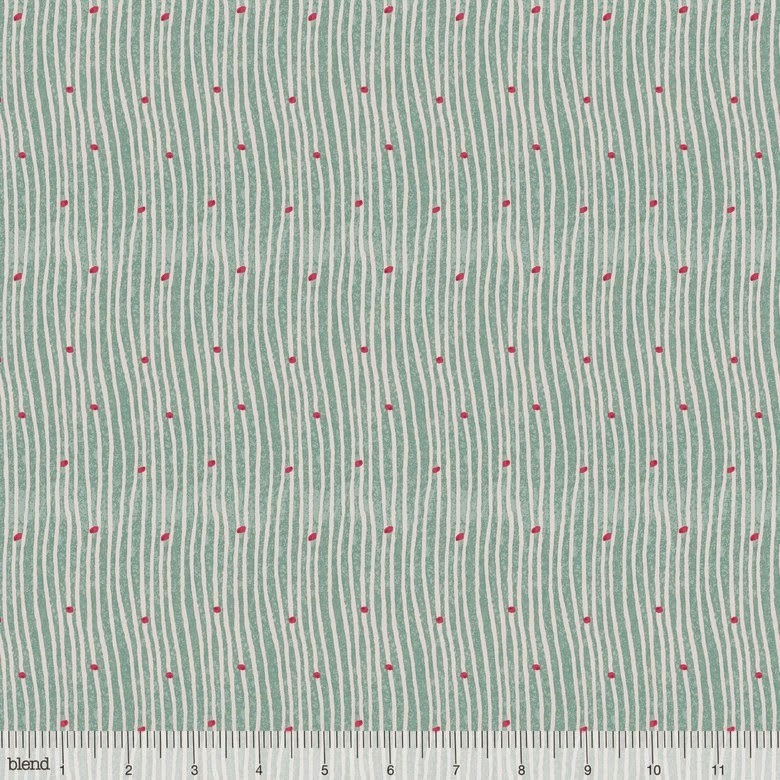 I also found this Rogue Stripe in blue from the same range and I really like it- organic and gentle with a little heat from the pink dots. I do love that in my trips around Eternal Maker, I always catch ranges like The Makers that have passed me by on social media but I am glad to have found. 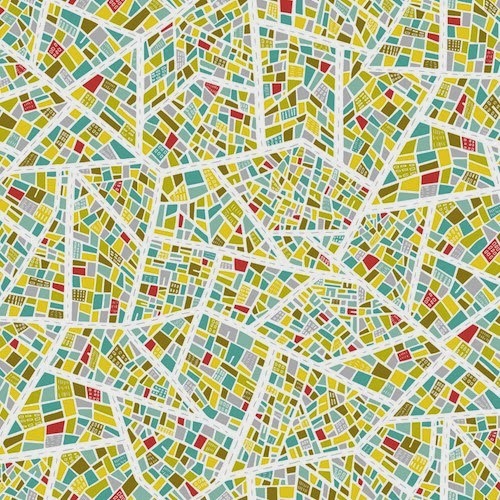 I stumbled across a print called Dairy Stripe from a Moda collection called Milk Cow Kitchen by Mary Jane Butters. Isn't that gorgeous! It would be great used on an apron or even as a quilt binding. 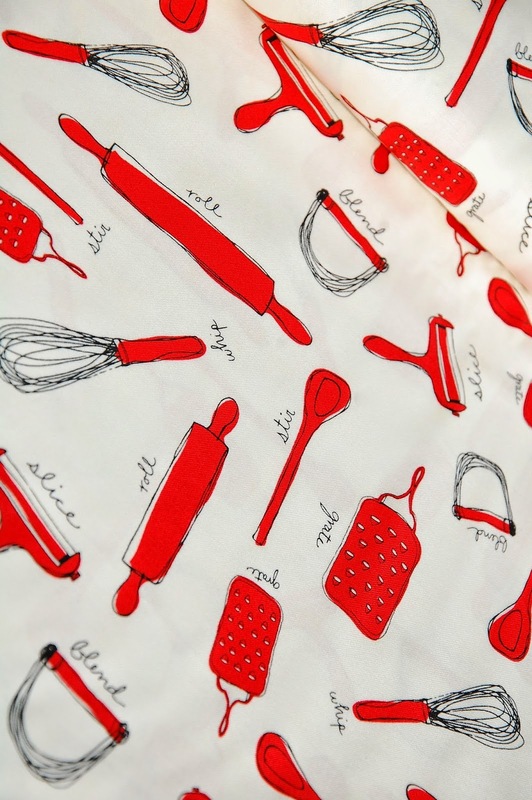 I found this print, Utensils in blue and red that are part of the same range. 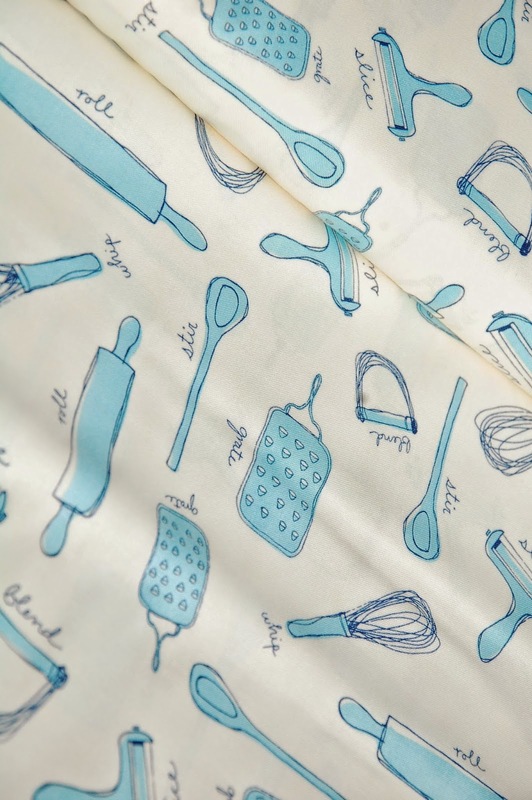 Mary Jane Butters designed the Glamping range for Moda a couple of which was another range that I really liked. I do always find some old favourites at Eternal Maker. 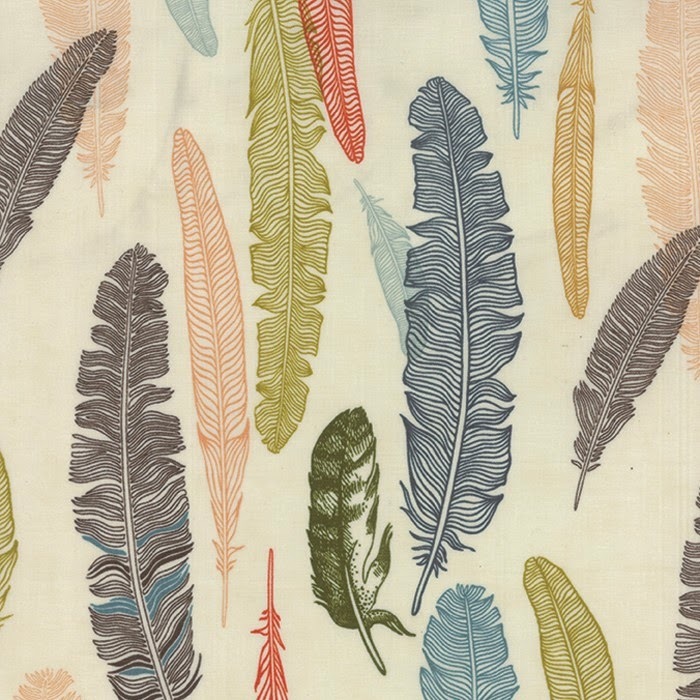 Jane Klopp's Amercian Jane prints are always a delight. 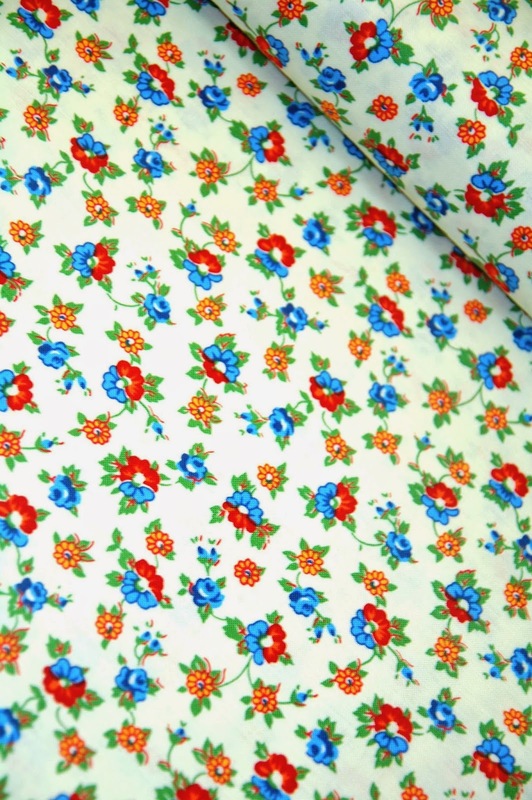 This Little Miss Muffet print is a classic vintage style floral. 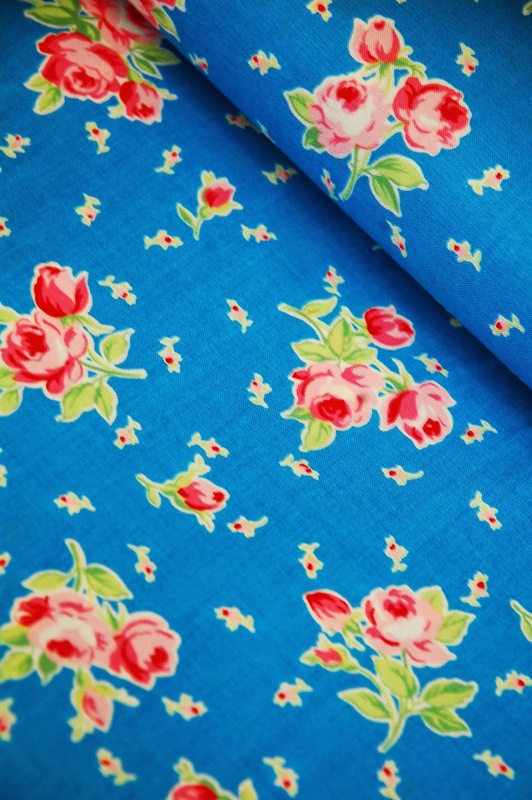 I think it would play beautifully with this larger Lecien floral, Medium Floral blue from Flower Sugar. There is a larger version of this print available too. For Echino fans, there is a 10th Anniversary fat quarter bundle of their newest prints. So vibrant! Love that hot pink. And to finish, a pattern/fabric combination which is the perfect marriage. Christine Haynes' Marianne Dress pattern for knit fabrics (you can find the sew along posts and tutorials here). 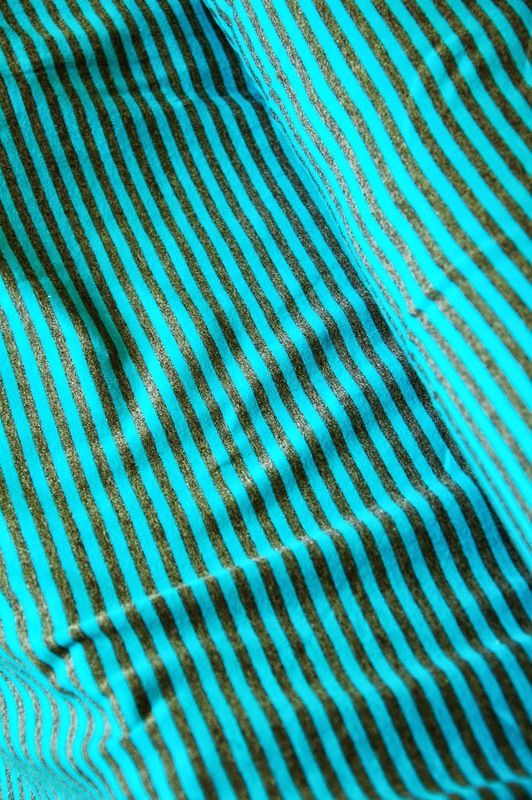 And this blue/charcoal cotton/spandex striped knit (also available in pink and green). 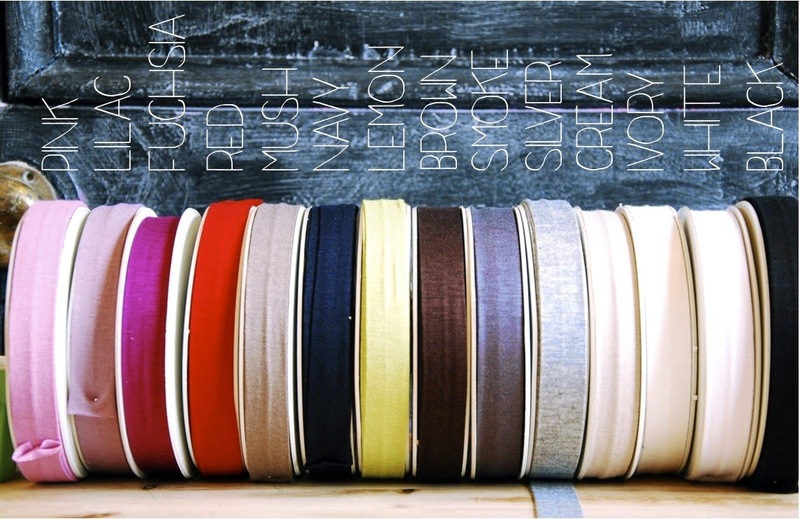 You can also find jersey bias binding, newly arrived, in a large range of colours and great for necklines. Random number chose comment 31, Beth. I've emailed you Beth, congrats! And thank you to all who took part and shared their favourite design eras. 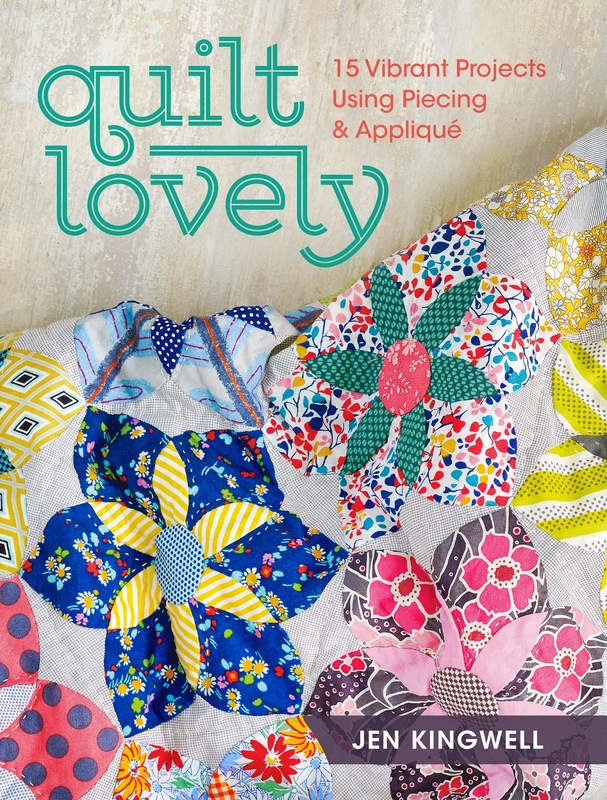 I was lucky enough to be offered the opportunity to interview Jen Kingswell, author of ‘Quilt Lovely’ as part of the book's release and promotion. As regular readers here know, I have been a fan of Jen’s since her Amitié shop block of the month patterns, ‘Green Tea and Sweet Beans’ and ‘Gypsy Wife’, started to pop up on quilting blogs a few years back so you can imagine how quickly I replied to the request and started drafting my interview questions. I met Jen at her hand piecing and appliqué master class during last years Fat Quarterly Retreat and she was a generous and inspirational teacher so to review her book is an utter pleasure. From her previous work I just knew it would be jam packed full of scrappy goodness and inspiring creations and of course, it absolutely is! There are 15 projects: 9 quilts and 6 pillows, and a huge variety of designs and techniques I cannot wait to try, but first let’s find out a little more about Jen and her quilting style. 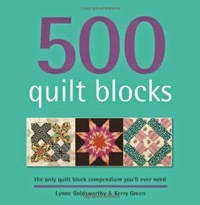 Congratulations on your ‘Quilt Lovely’ book Jen! 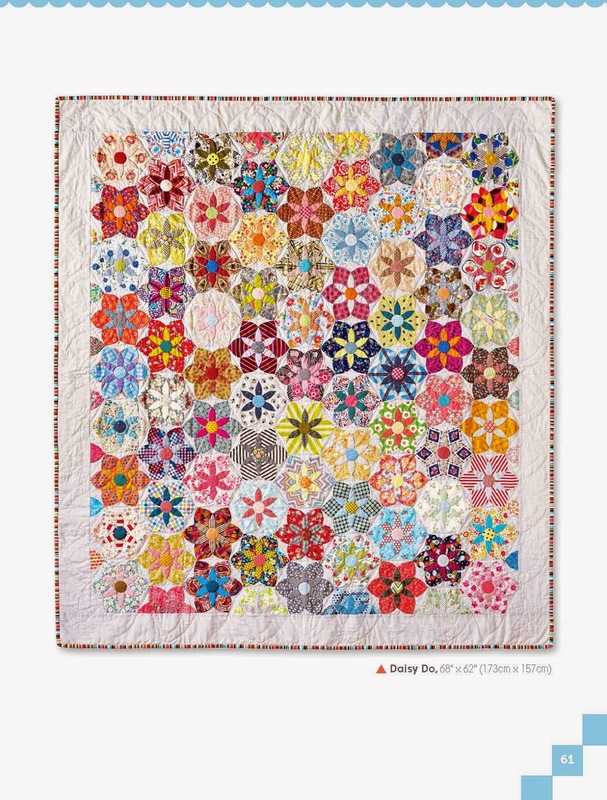 I love the mix of designs and techniques from repeated block quilts like ‘Flea Market Dash’ to the medallion style ‘Simply Red Centre’ quilt and the hand pieced ‘Daisy Do’ quilt. Where do you find your ideas and inspiration and how you go about designing a project? 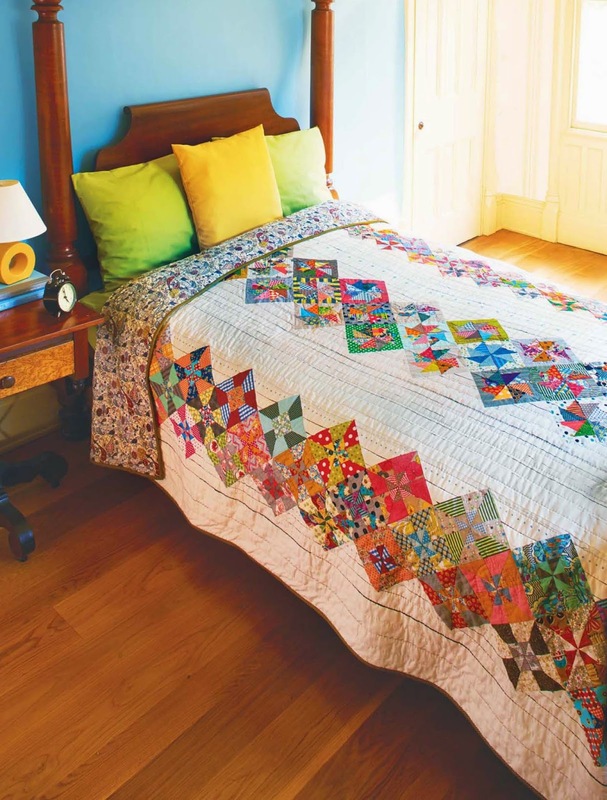 "Most of my quilts are made using traditional block. I love vintage quilts. I'm an "organic" designer. Not sure how else to describe it. I rarely start with a complete or set idea. I quite often change my mind as I progress. Sometimes things I start take a little vacation in the bottom of the wardrobe, then I'll get an idea, dig it out and it will head off in a different direction. A design wall is a great tool. Projects take on a different perspective when you can stand." It’s hard to pick a favourite out of 15 stunning projects but, in the face of fierce competition, I would pick the Glitter Quilt. It’s beautifully photographed and I know it would make the perfect long-term project, as although it’s made of 152 blocks I would only ever have to think about cutting out, preparing and sewing one block at a time! What are your favourite projects in the book? "Glitter is my favourite as well. I think you have hit the nail right smack on the head Kerry. It's a great way for anyone to start if they are not confident with scrappy quilts and mixing fabric genres or colour. As you said, you only need to think of one block at a time and three fabrics. Easy! Once you've made all those blocks, and you will be happy with each individually, play with the placement of them. You will find they all play together beautifully. Daisy do is probably my second fav." Hand sewing is an integral part of your work from the piecing through to the appliqué and even the quilting. What are your top tips or gadgets for hand sewing? "The beaut thing about hand sewing is you don't need a lot, which makes it quite affordable for beginners. It's all about personal preference for me. Most of the girls who work at my store all like slightly different things eg the thread and needles they stitch with etc. My advice is listen to what different people like, try some and see what works for you. I love a fine long needle to stitch with, both piecing and appliqué so I use a straw needle no 11. I stitch with a 50wt thread which is finer. The best tip is slow down and enjoy the process. Or at least give it a go!" Your projects have an amazing sense of colour combined with traditional quilting blocks and an eclectic and unexpected mix of prints that always gel together. I love the contrast between the vibrant ‘Clam Bake’ pillow and the calm taupe tones of the ‘Home Run’ pillow. Lots of quilters panic over colours and combining fabric. What advice would you give to those who want to add more colours and a scrappier look to their projects but don’t know where to start? "This is a really interesting question as I don't use any formula or templates such as colour wheels. I know what I like and that's what I run with. Start one block at a time. 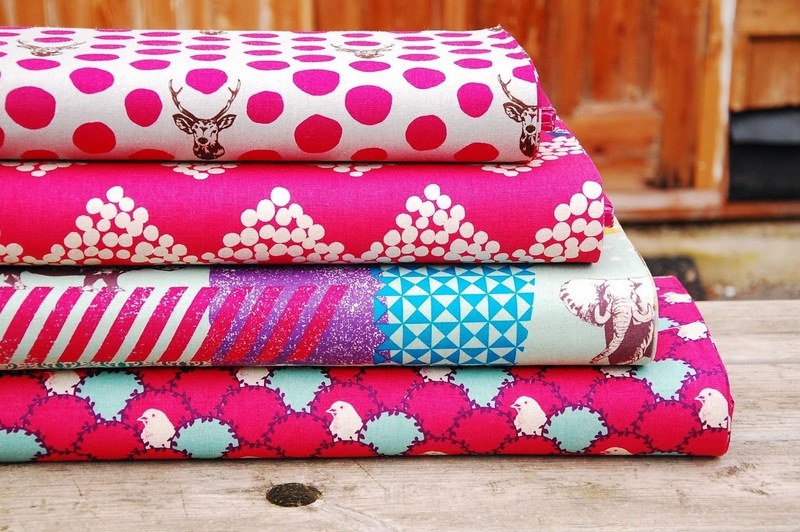 Use some favourite fabrics then add an unexpected print or colour and stretch the boundaries. 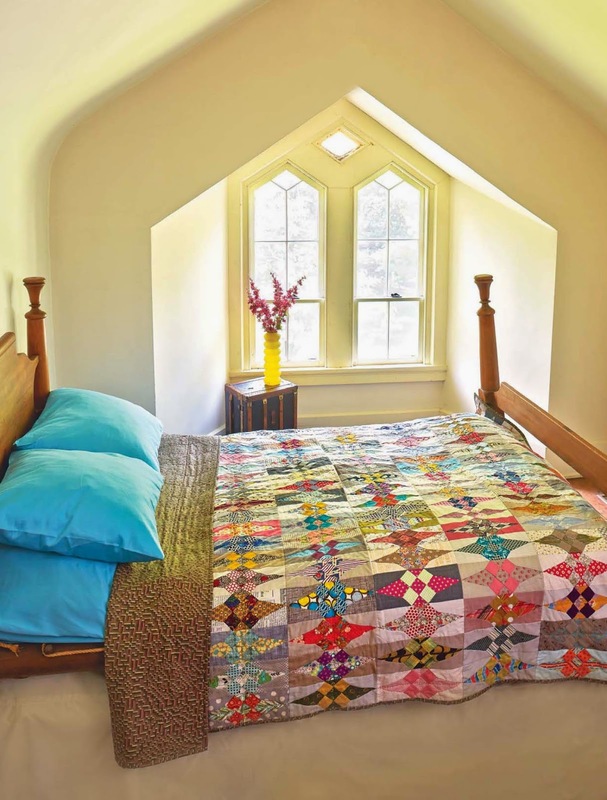 I think if you like all the fabrics and colours you should like the blocks and therefore the quilt. Take a risk, be brave and you never know where this may lead you. I guess the only rule I follow is it's my quilt so I make it the way I like it and you should do the same." 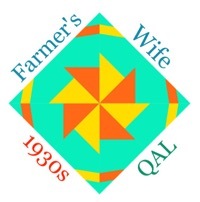 After many years in Australia working and developing your Amitié shop and quilt design business, you’ve been living in the United Arab Emirates for the last few years. Has this experience of living in a different country and culture brought new influences into your work? "Everywhere feeds my interest and influences my being. I think living in a completely different culture has opened my eyes and mind to many things. The one thing I noticed often was the different light. Colours were different. I found it fascinating." 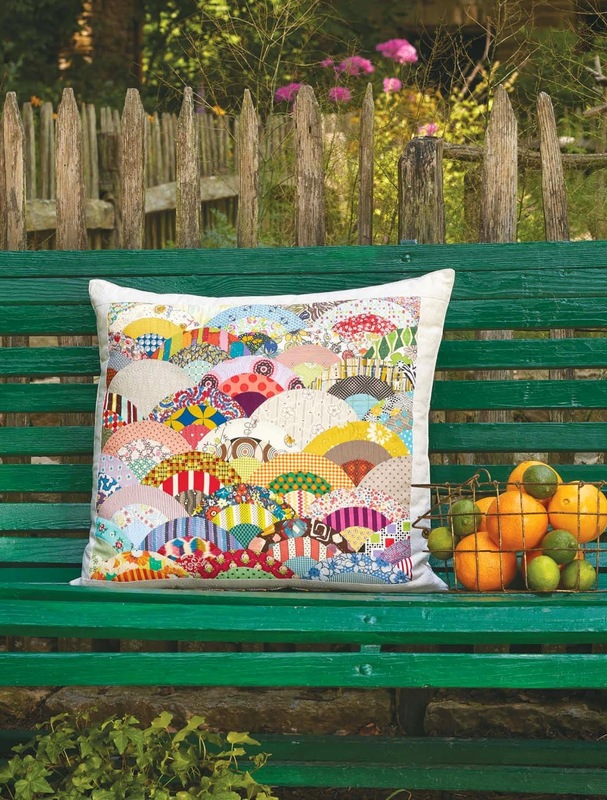 You travel extensively with your teaching work as well as promoting ‘Quilt Lovely’, your new fabric line ‘Gardendale’ for Moda and your patterns. 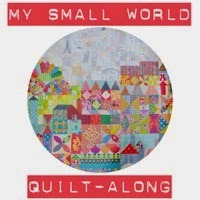 How does quilting fit into your life when you are you travelling? 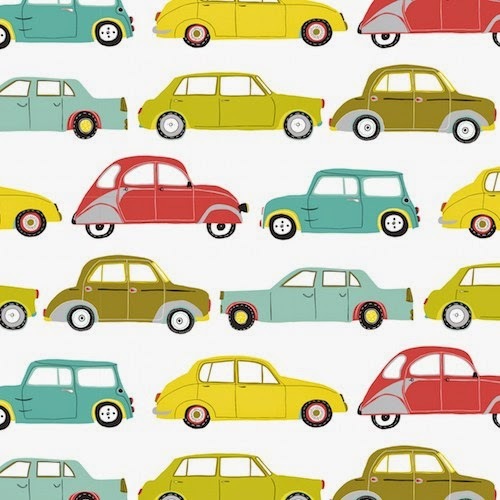 What sort of projects do you pack to sew on the move? "The beauty of hand piecing! I prep work to travel and on long haul flights I stitch and stitch. I've never been stopped with a needle and 3-4 pins. I just declare them in a zip lock bag. I can get quite a few blocks sewn between Abu Dhabi and Melbourne or Australia to the US. It's also a very welcome distraction when flights are delayed or cancelled. A small portable light is handy in hotel rooms if you can fit it in your luggage - hotel lighting is never quilter friendly!" Thankyou Jen. Such helpful advice and I love the idea of taking a portable light, what a top tip! I couldn't resist starting a Glitter quilt of my own, just one hand pieced block but this is going to be a long term project. I've noticed that Kellie has had some new deliveries in at Plush Addict, so now seems like a good time for my monthly visit and take a good look at what's in store! 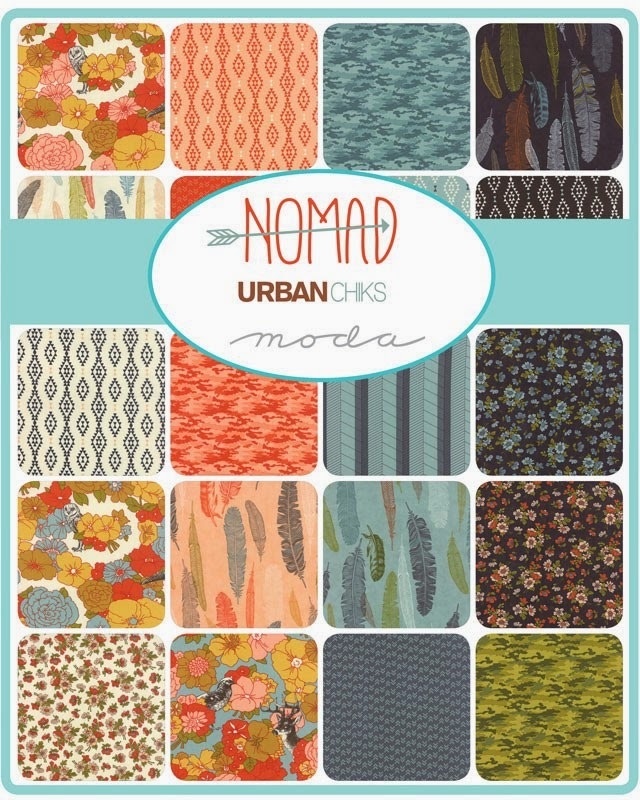 I am a big fan of Urban Chiks who design for Moda. I loved Swell, Dream on and 1974 and I am very much liking the look of Nomad. 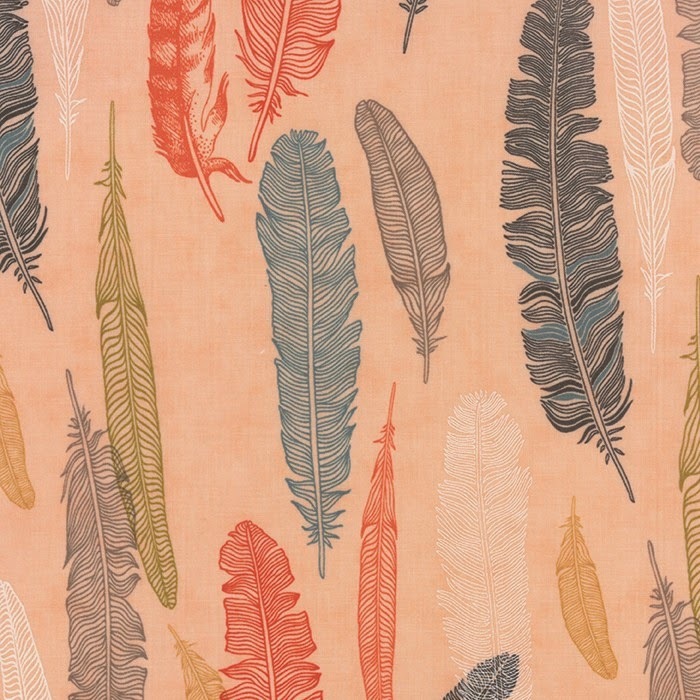 peach and black feathers from the Nomad range and I think they will fly out of the shop (see what I did there ;). 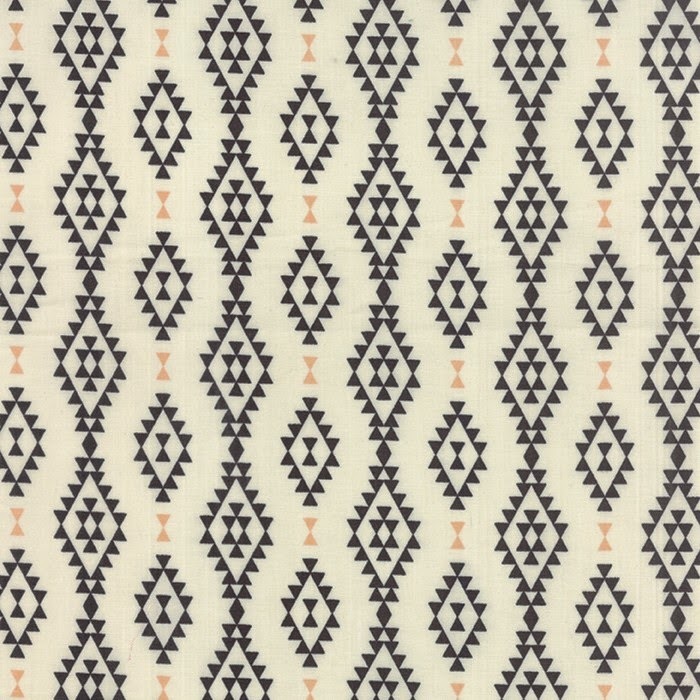 I really like this Aztec geometric print from the same range - this is the Natural colour way. It is also available in peach and aqua. 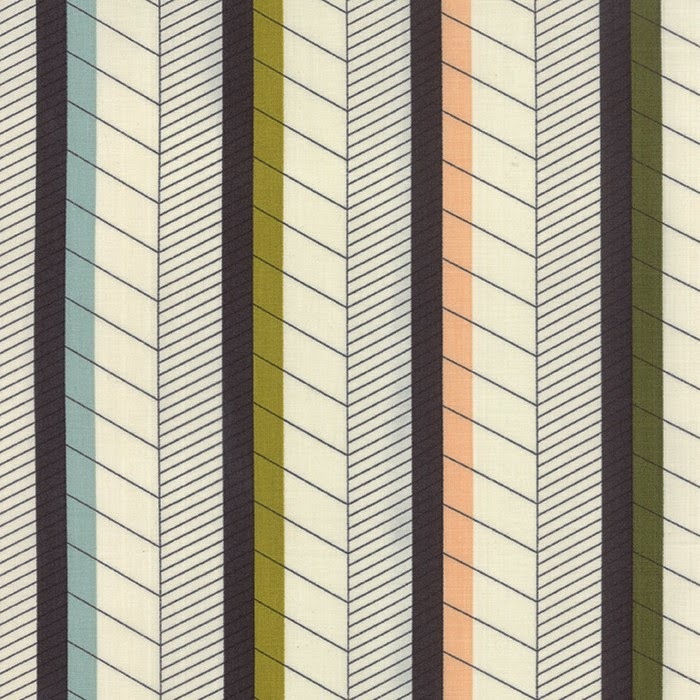 And this herringbone stripe print is perfection! Can you tell how much I like this range! 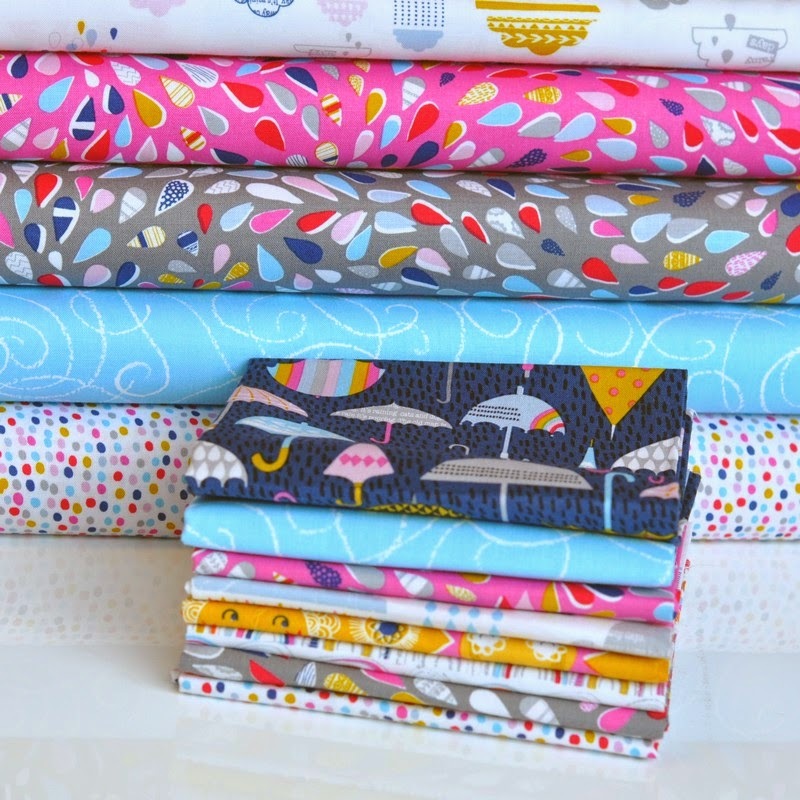 Precuts also available: jelly roll and charm pack. You know I love a good text print, and this one in particular is a great background fabric, Riley Blake 'Cottage Garden Newspaper Print in gray'. 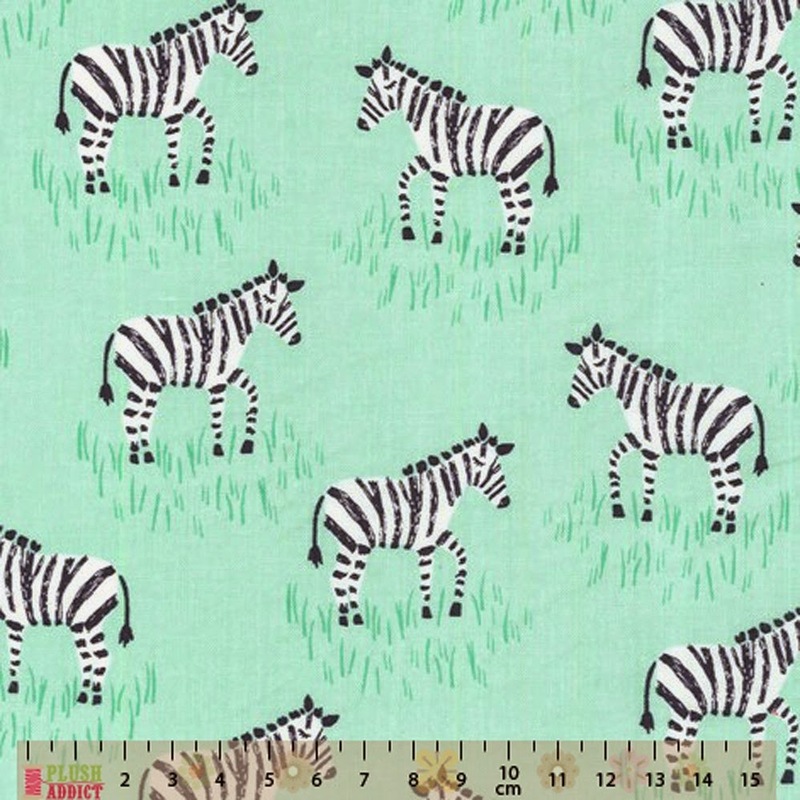 Dashwood are putting some great print ranges out- I feel especially pleased that this is from a British company too. 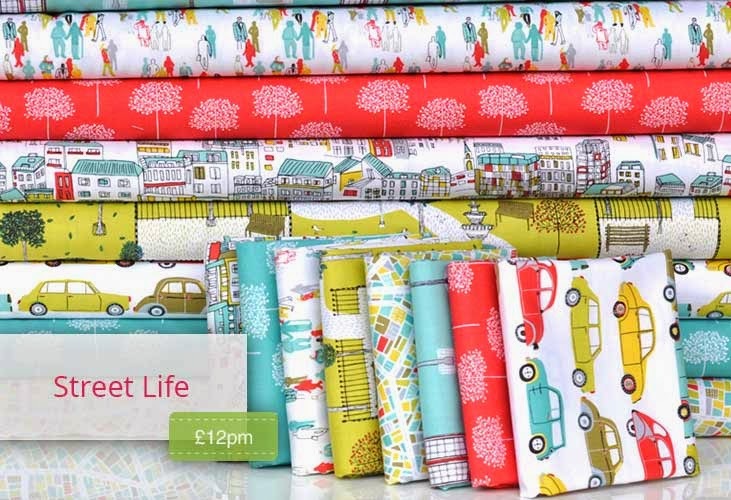 Street Life reminds me of the 1950s/60s Christmas prints with families and cars on but instead transported to Spring with a zesty bright colour palette. You can find a bundle with eight prints from the 'Street Life' range here. 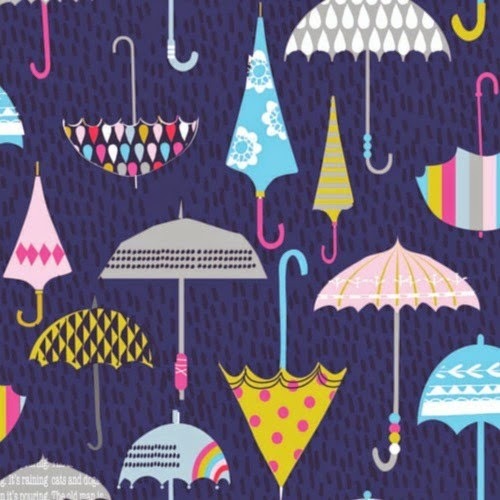 Also from Dashwood is this laminate 'Rain or Shine' fabric- perfect for spring in the UK. Enjoy your browse around Plush Addict! 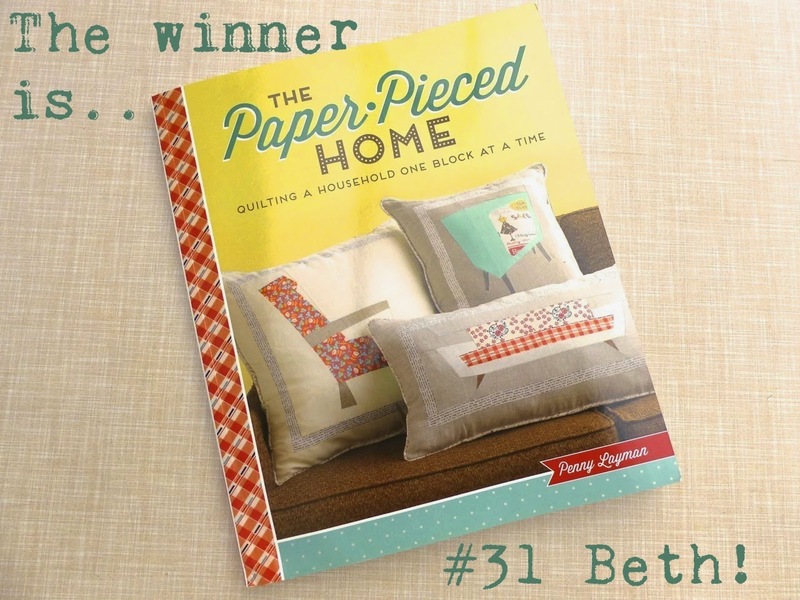 You can find my review of Penny Layman's The Paper Pieced Home here. This post is number six on the blog hop for the book. In the interests of disclosure, Penny sent me a copy of her book and I don't offer even the slightest pretence at a lack of bias. I am totally biased, Penny is a super talented designer, I am happy to work in partnership with her in Sew-Ichigo and a to call her a friend. 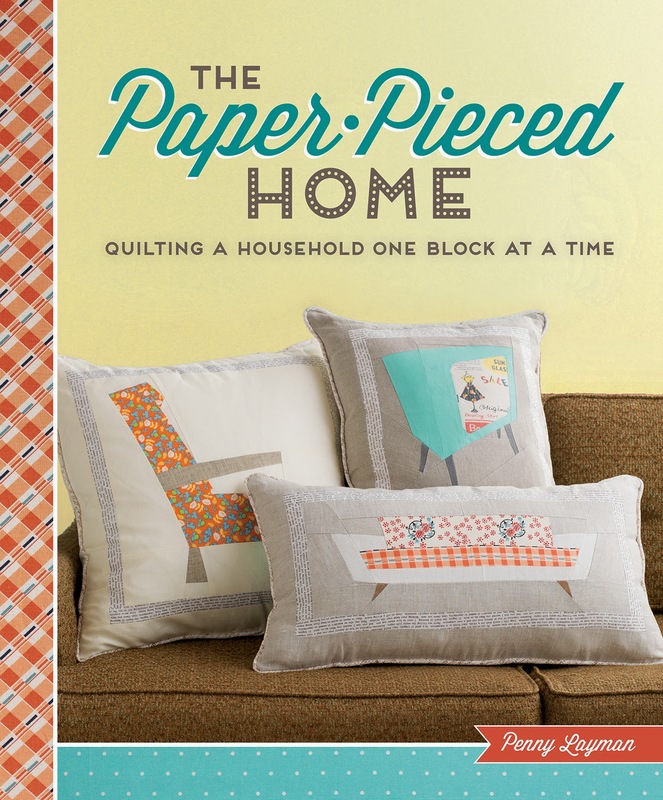 Taking all that into consideration, even if I barely knew her, The Paper Pieced Home is amazing and should be in every foundation piecing fan's personal library. Her designs constantly make me smile and that's what I look for in great design. I like simplicity in paper pieced designs. I don't like over engineered blocks or hyper realistic imagery, instead I look for character, wit and humour. 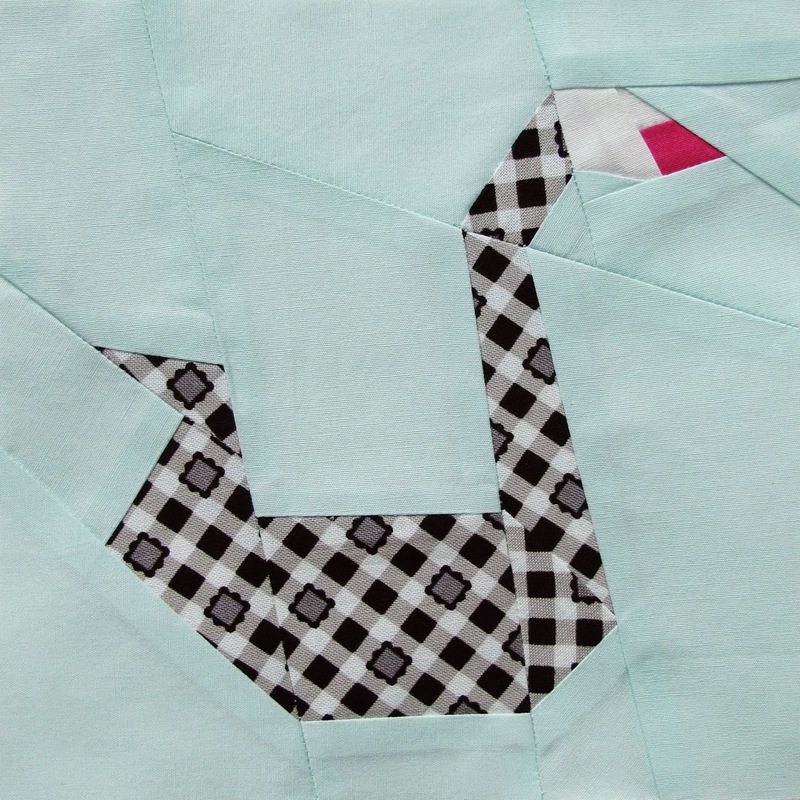 Paper piecing has a lot of limits- curves and Y seams are tricky to achieve and some details are better added using embroidery or appliqué rather than a tortuous number of seams. The skill when designing a block is to capture the essence of the item you are trying to represent and construct it as simply as possible: the design is taken to the bare essentials and given a twist or quirk to make you recognise and love it. Nobody likes a bulky cluster of tiny seams all coming together at one point or five sections where there could be two. The best designs have all their section lines and seams in just the right places, to enhance the design, not detract from it. I mentioned how much I liked this lion block when I wrote my review so naturally, this was the block I chose for the hop. All the designs are avaible on a CD included with the book so no need to faff with a photocopier or scanner. 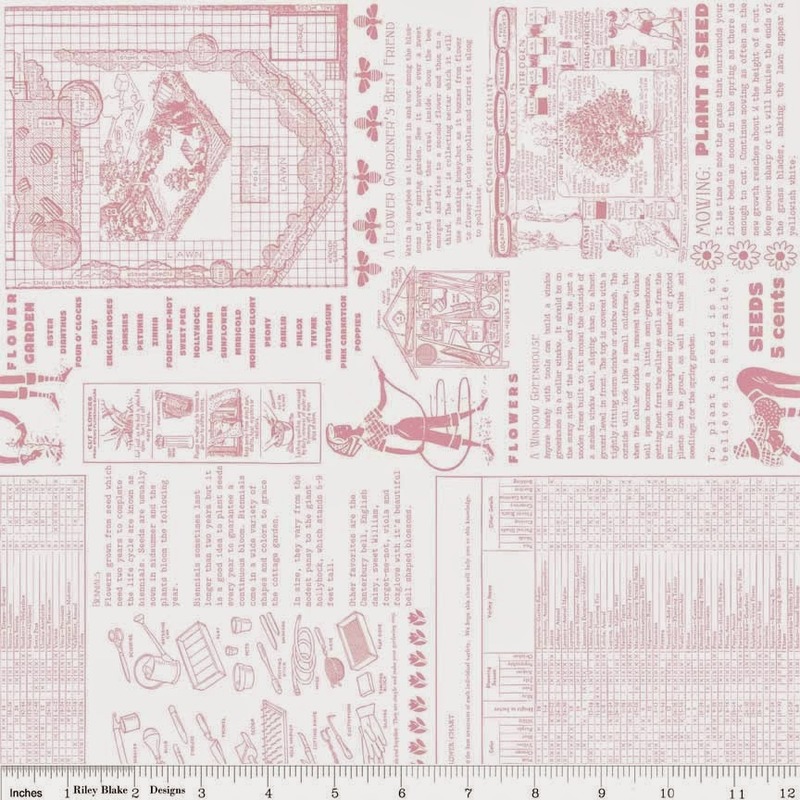 This is a 10 inch block which prints on two sheets joined together. Some of the sections spread on to both sheets with an overlap to join together so I printed out both sheets and traced the design on to velum with a Pigma micron pen so that the main horizontal seam would be evenly spread between both bits of paper and avoid joining sheets of paper. It worked really well. 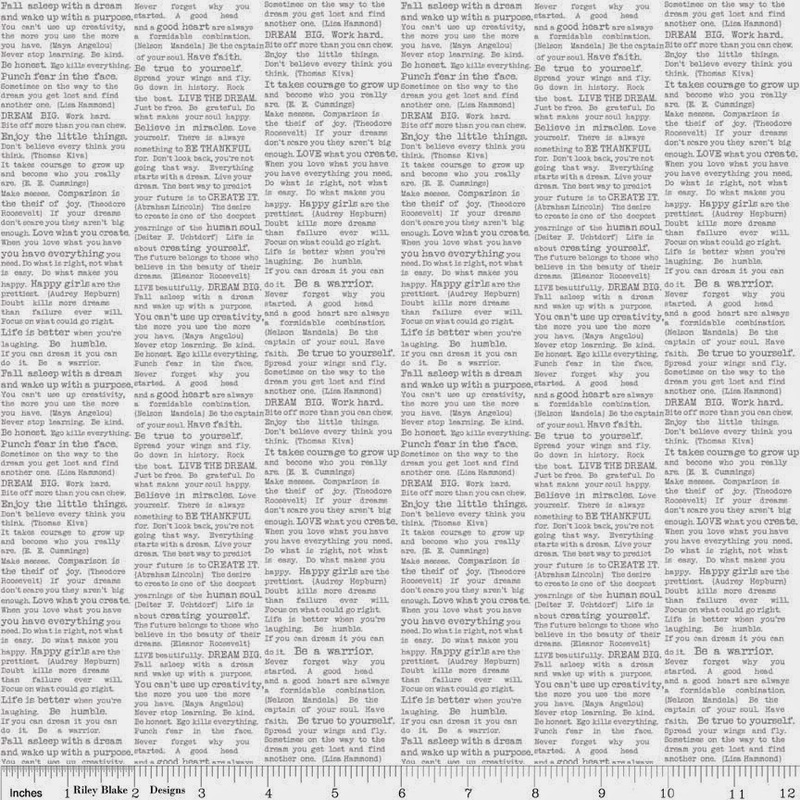 After that, the piecing was very straightforward. 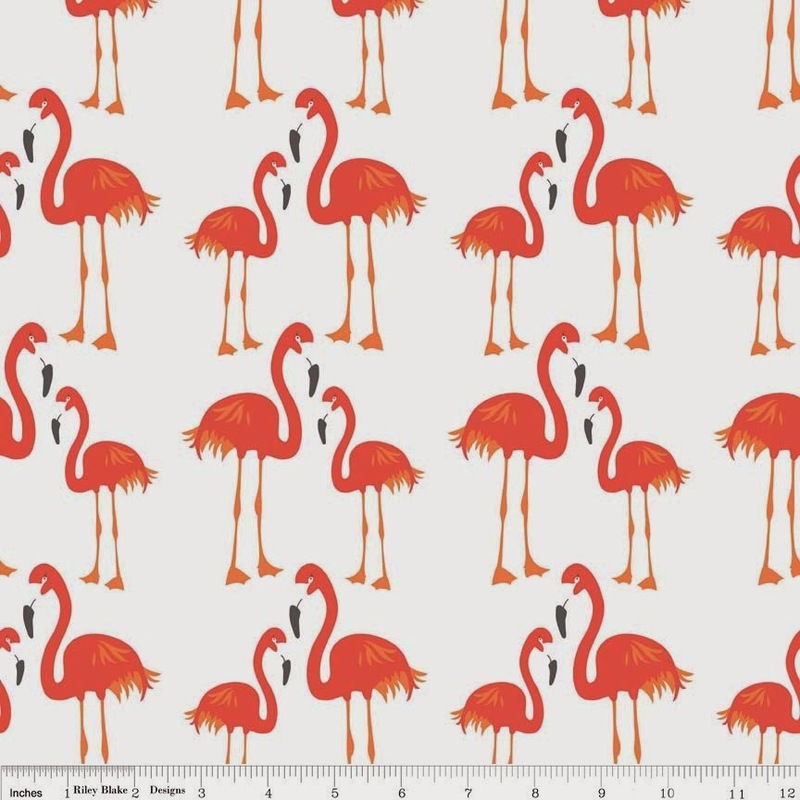 There are a lot of sections but the design flows logically and there are only four fabrics involved, and they were all either solids or ditsy prints that worked in any direction. There are plenty of tick marks to align the seams and no seam rippers were called for! 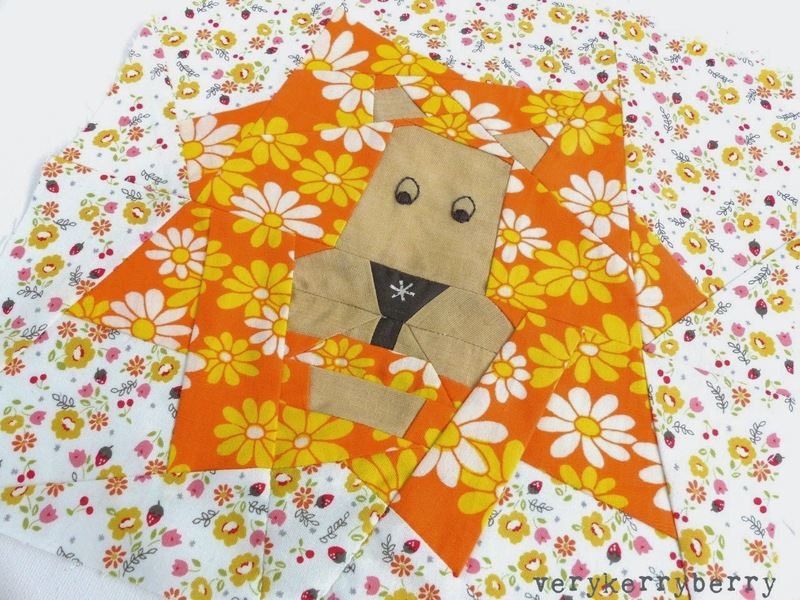 The background floral is from Ayumi's Lighthearted collection for Kokka and the orange floral is a vintage 60s fabrics found at a bootsale! I love the final block. 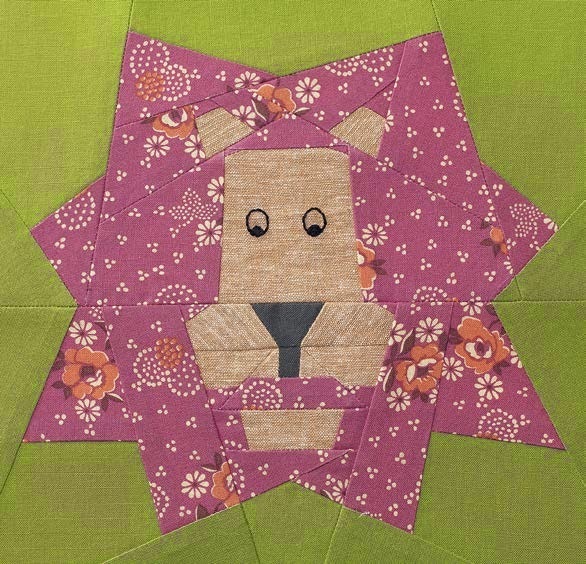 One of my top tips for paper piecing is to make the block edge seam allowance much bigger than you need so you can trim the block down to the perfect size. 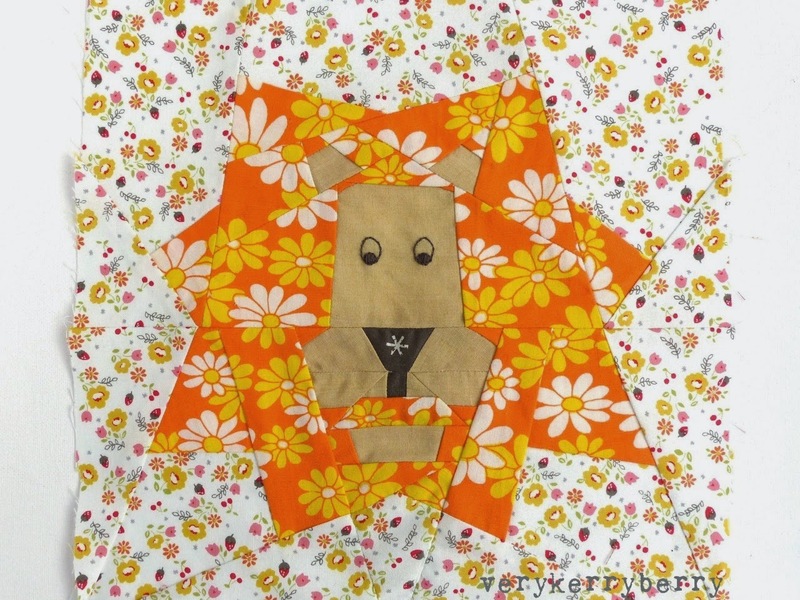 I think I will make it into a sewing machine cover for my Bernina with lots of vintage style prints and some linen, although all the blocks in the 'Playtime' chapter would make a wonderful child's quilt/playmat. The publishers also have a copy of the book to giveaway- a physical copy for a USA winner or a PDF digital version for a winner outside USA. For a chance of winning, leave a comment below- how about telling me your favourite design era? 1970s, Edwardian? Whatever it is, let me know! Make sure I can contact you by email via your profile or comment. Winner will be chosen by random number generator a week today. Enjoy the other stops on the hop! Penny and I have a new pattern set available from today at Sew-Ichigo. 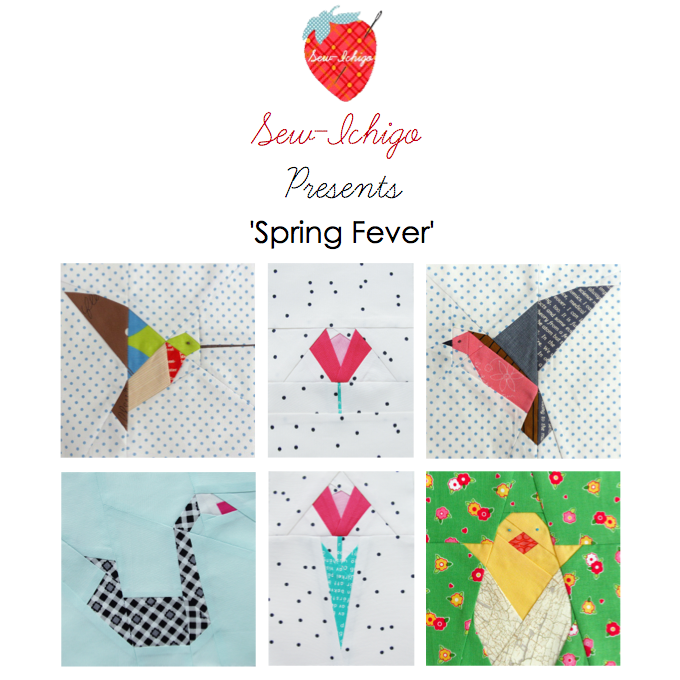 'Spring Fever' features blooms and birds and the designs are available in one big set or as single patterns. 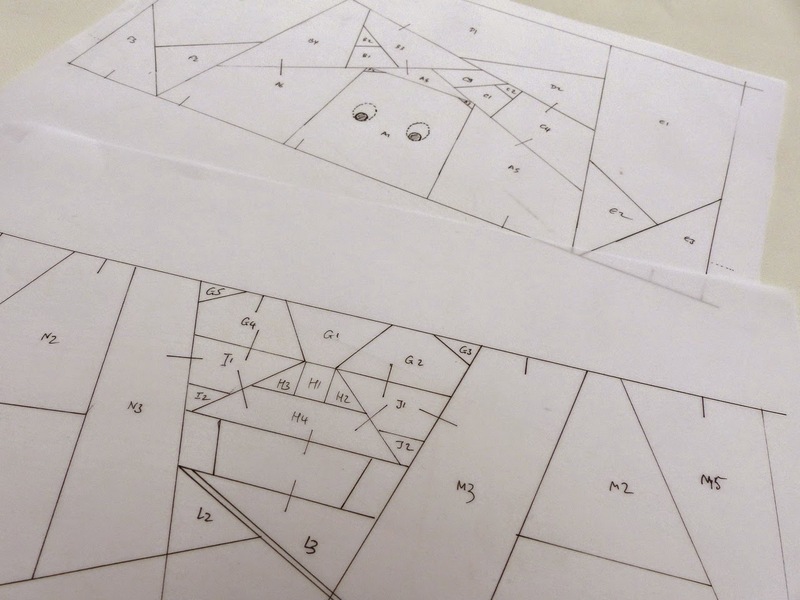 When we design pattern sets for Sew-Ichigo, we like to offer a range of options- both in designs and complexity. The easiest pattern in this set is TulipsX2. 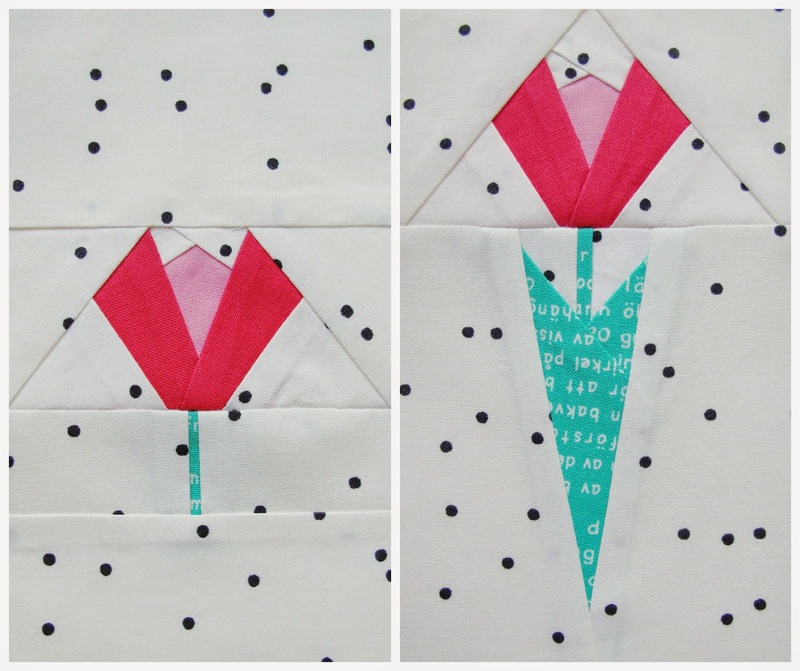 There are two variations and the short tulip is a great beginner foundation piecing pattern. 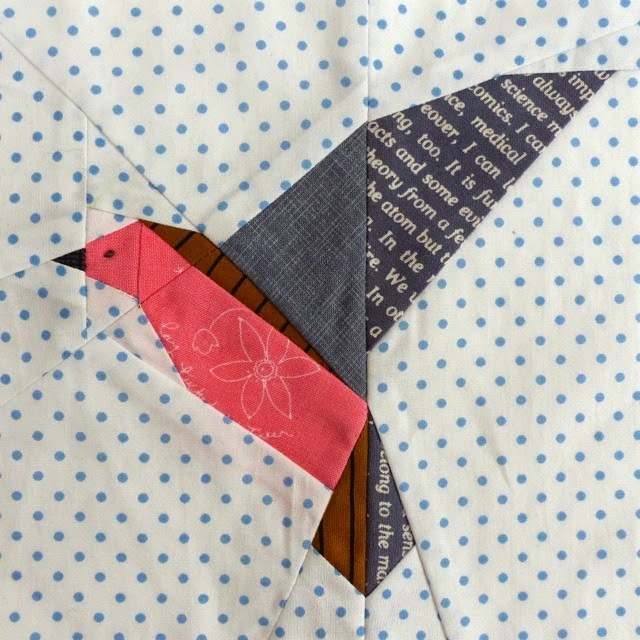 Penny is making a gorgeous mini quilt using the tulips in combination with the hovering birds. All the bird blocks are 6 inch square and the tulips are 4 x 6 inches so they work together easily. We couldn't resist a little chick with Easter so close. 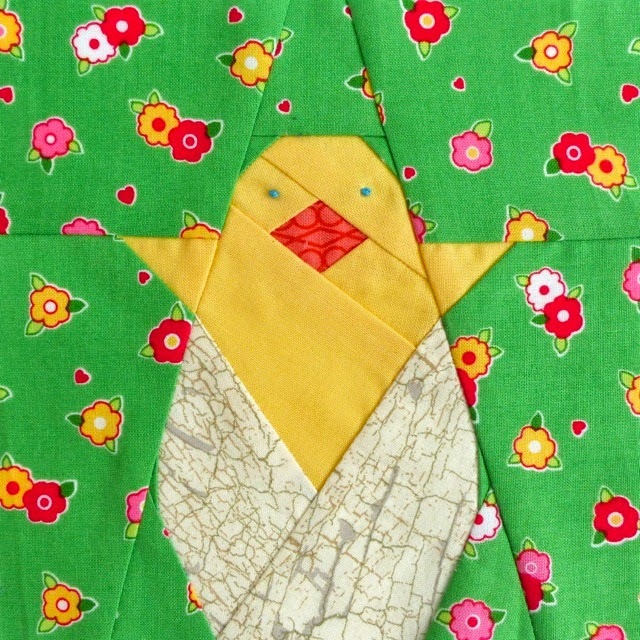 The 'Hello Chick' design was made very much with children in mind and would be perfect for a little drawstring bag or a fabric basket for Easter egg hunts. 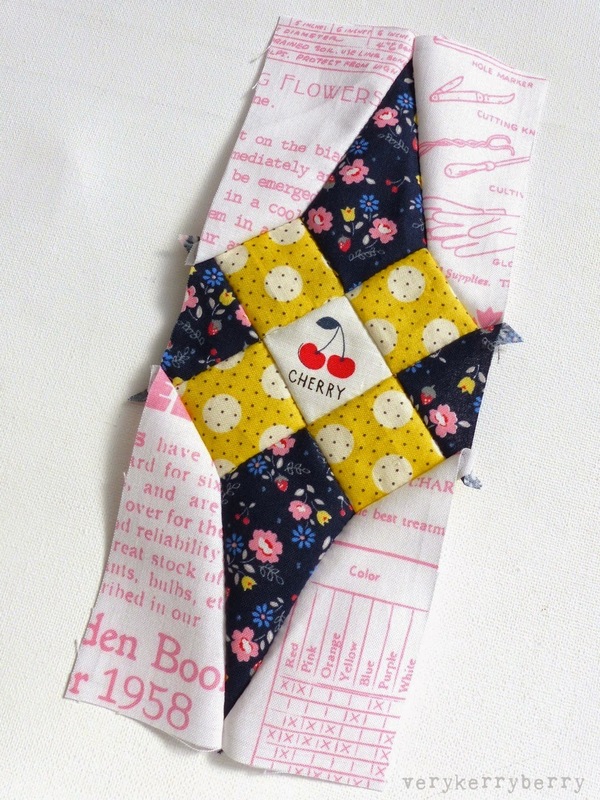 It is sewn in three sections and is suitable for a beginner with a little foundation piecing experience. 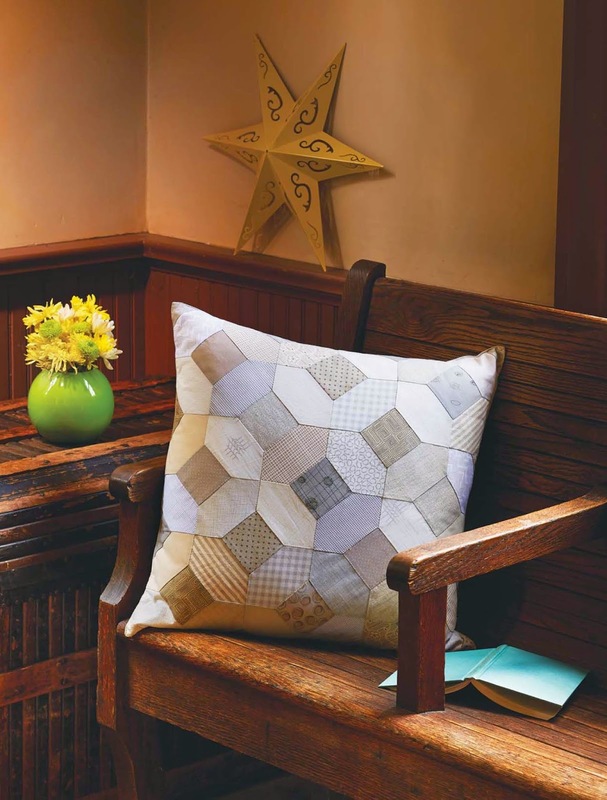 The 'Flighty' patterns are a pair of hovering bird blocks were inspired by origami designs. I wanted to include birds from different countries and Penny has sent me many pictures of humming birds who visit a feeder at the back of her house. They are a fascinating bird and seem rather exotic- no Hummingbirds in the UK! 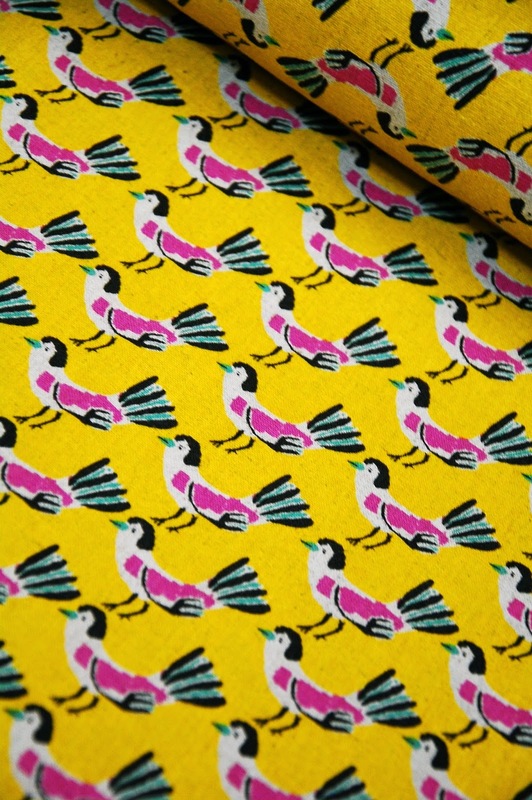 Hummingbirds come in lots of vibrant colours so there is a lot of potential for combining prints and colours in this block. I chose a chaffinch for this block because it is a common bird in the UK and hovers in flight. These colours are for the male. 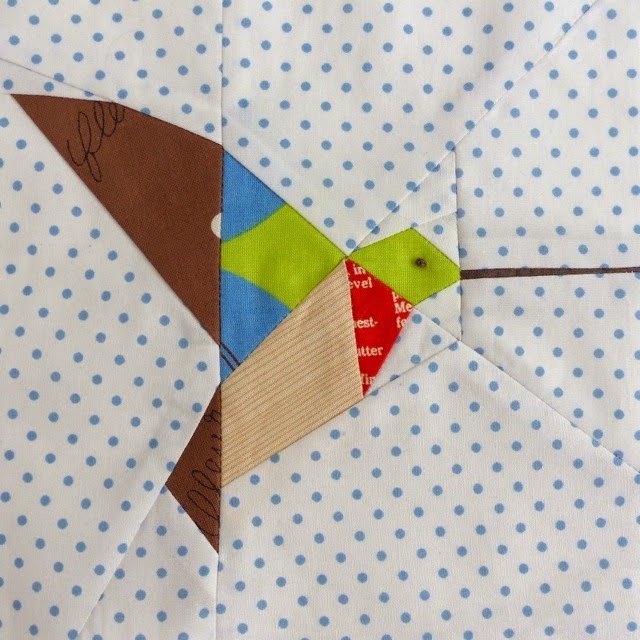 You could easily adapt this block for other birds and either leave out the areas shown in brown or use other colours. I love this swan, 'Dawlie', that Penny designed. I live in Devon and a nearby town, Dawlish is famous for its black swans, hence the name! 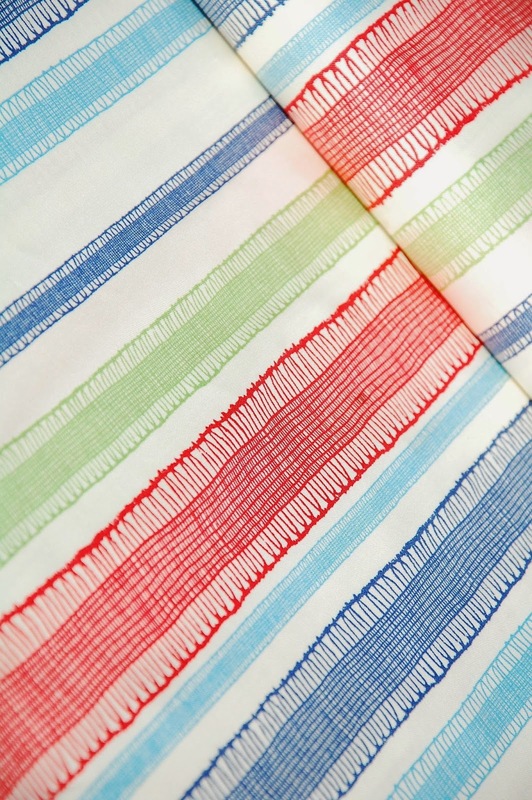 We have some more patterns coming very soon in an exciting collaboration. More news soon!